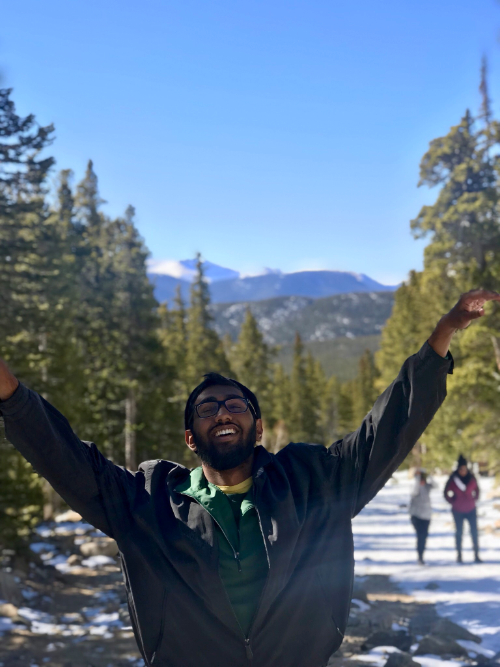 Washington University Amgen Scholars program the following Summer, he worked in the lab of Dr. Irfan Lodhi to understand the role of a peroxisomal protein on adipose tissue development. This work’s goal was to eventually develop therapies for metabolic disorders such as obesity. After returning to the Afkhami lab, he started working on modeling the evolution of three partner mutualisms as part of the Center for Computational Science Fellows program. He will eventually write his senior thesis under Dr. Afkhami’s supervision. In addition to his dedication to research, Sathvik is heavily engaged in community outreach. As a freshman, he established University of Miami as the host site for the South Florida Regional Science Bowl, the regional competition for Department of Energy’s National Science Bowl. This move helped increase representation of public South Florida high schools in the national competition. He continues to engage in service as a teaching assistant for Bridges to Baccalaureate, a program to encourage Miami-Dade College students engage in hands on research and unique course experiences through UM’s Office of Undergraduate Research and Community Outreach. He also serves as the president of UConnect, an undergraduate research and peer-to-peer mentoring organization, committee member for the inaugural Florida Undergraduate Research Summit (FURLS), and a committee member for the annual PRISM Leaders in Science Series. Through his research and outreach activities he hopes to broaden participation in the sciences and emphasize the impact of interdisciplinary thought in catalyzing scientific progress.